What happened the last time you sat down at your computer to write a blog post? Did it come easily to you, with the words flowing effortlessly through your fingertips? You’re not alone. Writing isn’t everyone’s strength and the stress of writing a blog post is compounded when you don’t know what to write about or don’t know what your audience needs to hear about. Plan your content to brand, customize your passions, and develop your coaching practice. 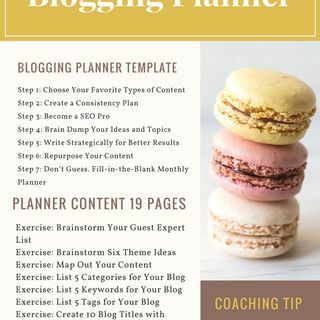 This planner podcast includes exercises, ... See More where you can build your content around giveaways and packages for your clients/customers/members.